The Consummate Hostess: Cheers for Happy Hour! Before the boots, plaid and cider, let's raise our glasses to a wonderful summer filled with memories sure to last a lifetime. This cocktail brings to mind long days at the beach, colorful fireworks filling the summer sky and the juiciest watermelon imaginable- I give you, The Lemon Verbena Cocktail. The Lemon Verbena Cocktail is a light and refreshing cocktail, a perfect farewell to summer. The use of crushed ice is crucial to creating the delicious overall effect. Enjoy! Muddle verbena, lemon and simple syrup in the bottom of a tall Collins glass. Add the gin. Put crushed ice on top of the mixture and top off with club soda. Garnish with a lemon wheel. 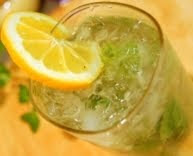 This entry was posted on 7:47 AM and is filed under lemon recipes , lemon verbena cocktail . You can follow any responses to this entry through the RSS 2.0 feed. You can leave a response, or trackback from your own site. I love lemon verbena and I love gin! So this is absolutel perfect! I am going to have one today! That sound delicious! May have to try that this weekend. Have a great holiday! Serefe! as we say here to a lovely summer.By the way I will also try your receipe, İt sounds very good. I don't drink, but I do love lemons, verbena and lemon verbena! LOL. That photo you commented on was actually taken at Morocco in Epcot, Disneyworld, of all places! Have a great holiday weekend! Sounds so summery and fresh! Sounds delish! Have a great Labor Day weekend! What a great summer it was!! and this drink looks so fab, must give it a try. The perfect drink....Have a very happy weekend, xv. Mmm wouldn't say no to that drink, beautiful. i love the smell of lemon verbena... mmmmmm! Where do I find this? Sounds like a wonderful cocktail!